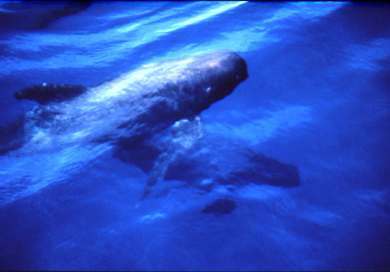 The Whales and Dolphins Cruises are an extremely popular attraction in Tenerife. Around the south coast of the island, because it is sheltered from the wind, the Atlantic Ocean is especially calm and you can find Pilot Whales in abundance, living and breeding there. 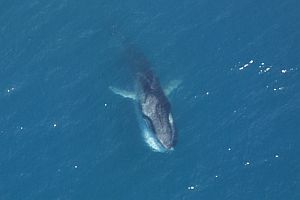 Sometimes, fin and sperm whales have been spotted, too. 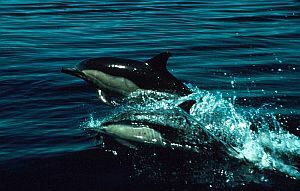 Such species of Dolphin as spotted, common and bottlenose may also occasionally be seen but, because they are essentially migratory animals you don't stand such a good chance. With the whales, however, its a certainty. The various whales and dolphin cruises normally follow a route taking them through the same waters that the creatures frequent and the vessels used come in all shapes and sizes, to suit everyone's tastes. They sail from Los Cristianos and Las Americas, sailing to Los Gigantes. As I said, the sea is usually agreeably calm, but, in the unlikely event of bad weather and rough sea, the cruise is cancelled, with a full refund of your payment. The Freebird Sailing company have been operating since 1993, using six luxury catamarans holding from 55 to 110 passengers. This is one way to view the whales and dolphins in style! Cruises range from three to five hours and are ideal for families, with Chico the Clown on hand to keep the kids entertained. Safety is of paramount importance, with each catamaran being fully insured and equipped with life jackets. A typical cruise would set off from Puerto Colon and sail to about three miles off the coast, where anchor will be dropped, giving you the opportunity for some serious whale and dolphin spotting. The company provides an expert guide, to tell you anything you want to know. Eventually, the cruise resumes, sailing further down the coast to come to rest in a secluded bay, where you will be encouraged to take a swim in the clear, calm waters. Snacks in the form of sandwiches are available during the cruise, along with unlimited drinks. Finally, the catamaran weighs anchor and returns to Puerto Colon. A special, luxury catamaran, the Freebird One, provides VIP sailings, catering for up to 196 passengers. All catamarans are available as private charters, for special events. The Royal Delphin is a luxuriously equipped, glass-bottomed catamaran built specially to cater for cruises to see the whales and dolphins. In operation since 2000, it carries up to 200 passengers. The cruises, varying from 2 to 4½ hours take you from Puerto Colon out into the ocean, where you can observe the creatures in their natural habitat. Below decks, you can witness them as they swim under the vessel, via the glass bottom. If you prefer stay up top, underwater cameras pipe images to TV screens in the lounge. The boat then travels on to the bay of Masca, where anchor is dropped and you are invited take a swim in the sea. At this point, there is also a buffet lunch served and free drinks are available. Finally, on the journey back to Puerto Colon, the catamaran takes you along the coast, past the impressive cliffs of Los Gigantes. The Royal Delfin is opulently equipped with an elegant, air-conditioned lounge with bar. Bonadea II is a Spanish owned catamaran that has been operational since 2000. It operates on a slightly smaller scale than its larger counterparts, catering for only 22 passengers, maximum. 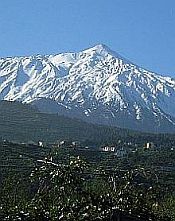 Most of its cruises are two hours, but longer cruises can be organised, by prior arrangement. The two-hour cruise takes you out into the ocean to search for the whales and dolphins. After a good while, during which you may take lots of photographs, the catamaran will return you to the harbour. The Bonadea II is ideal for group parties and is available for charter. With the success of the Pirates of the Caribbean films, this cruise is proving very popular with younger holidaymakers. Essentially, it's just another whales and dolphin cruise, but with a difference. The vessel, called the "Jolly Roger", on which you're taken out is a replica of an 18th century galleon and it is manned by a pirate crew! They are dressed like pirates, are armed with cutlasses and pistols and, no doubt, go around saying "Aaargh!" a lot. Apart from this unique aspect of the cruise, its itinerary is much like the others on offer. Setting off from Los Cristianos harbour, it heads for a good whale and dolphin spotting area, then continues up the coast to a secluded cove at La Caleta, where passengers may enjoy a dip in the sea. Also, at this point, lunch is served. The whole cruise takes three hours.